I had wonderful time speaking with Jane Austin, PreNatal Yoga teacher, at Yoga Tree, in San Francisco a couple of months ago. I found her to be relaxed and cheerful, with a sort of inner confidence. Such an important combo for me, and for women in pregnancy, as we are going through a massive life expanding transition in our lives. Round about the time I chatted with Jane, I found out I was pregnant, with my second child. I was elated, but with that elation comes all the intensity of having another life grow inside you – extreme fatigue, nausea, insomnia, massive discomfort doing just about everything and anything, especially towards the end, when the baby inside is so big. That being said, I am so happy to be pregnant, and to be of service to the beautiful life inside of me, and to have to ability to expand to birth him! As with any massive discomfort, I am always looking for ease, and freedom, which is why I was so stoked to get Jane’s new PreNatal Yoga DVD. Jane, a childbirth educator, doula, midwife, has been teaching prenatal yoga in SF for 15 years. She was such a joy to practice along with. Her constant smile infuses confidence in even the most unsure, and awkward mama-to-be. She starts out with a meditation connecting with our breath, and our baby, which I loved. Then we moved on to some arm strengthening (for holding our new babies, and our toddlers). Then came hip openers, which felt absolutely divine. My particular favorite was the one legged squat, with hip rolls. After that one, I felt like I had a mile more real estate inside my hips. Exactly what I want for birthing, and just for all around better posture. The amount of weight we carry forward in pregnancy can pull our bodies forward and down. By opening the hips, we stand more upright, are more stable, and can more easily access a full squat, an awesome birthing position. The class moved on with balancing poses, and came back down to hips and final relaxation, and more baby centered meditation and visualization. I love this part, because I tend to focus on my body, and forget about the little life growing inside me. It was so good to connect with him, and to feel him inside of me responding to my love and attention. The music, is smooth, consistent, and nonintrusive. The women in the video are all very pregnant, and are real students in Jane’s classes. She teaches 4x a week in at Yoga Tree, and does Teacher Trainings twice a year. I practice daily, am a yoga instructor, and have a fairly athletic practice. I loved this Prenatal DVD practice because as I felt honored, and understood, with where I am now (at 5 months pregnant), where I’m going ( birth), while acknowledged for my strength (as a mother). 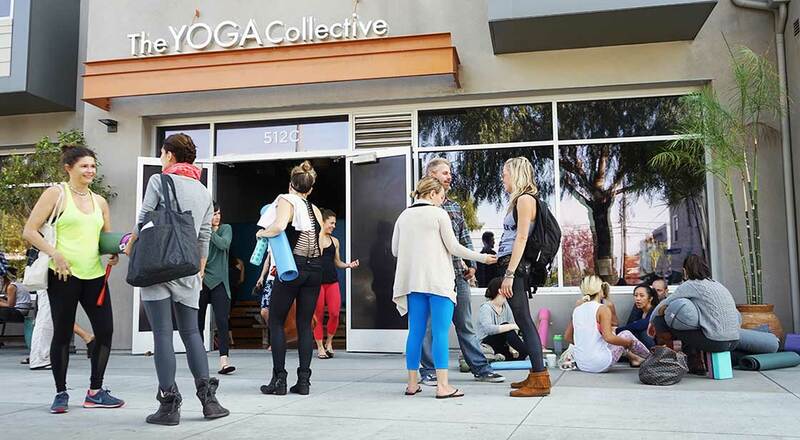 The Yoga Collective: A Venice Beach Online Yoga Studio.